KUCHING: Parti Keadilan Rakyat (PKR) must win at least 18 seats in the next state election to take over as the new Sarawak government. 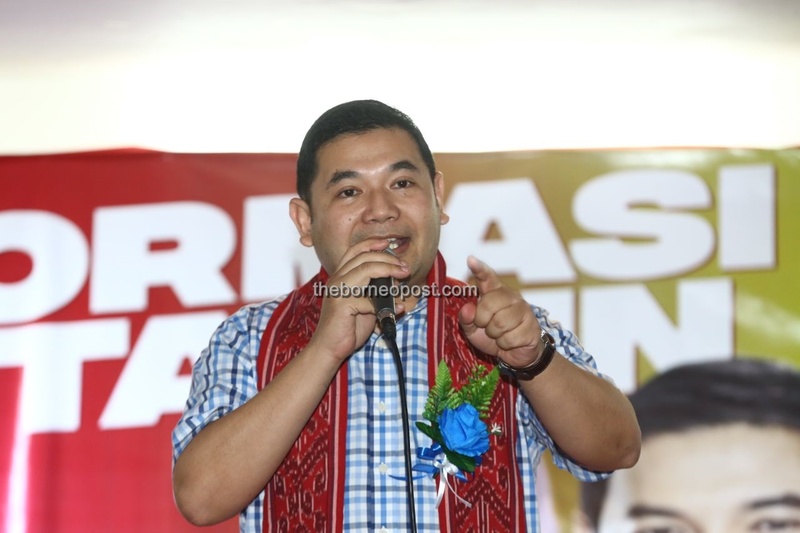 Its vice president Rafizi Ramli, who is vying for the party’s deputy president post, said PKR which is now in the federal government should win the next state election to come forth as the anchor party of the new Sarawak government. “We PKR is the government at the federal level. Two years from now, we must wrest Sarawak from GPS (Gabungan Parti Sarawak) or whatever parties they are to become the next Sarawak government. “When PKR is in both the federal government and Sarawak government, we can better negotiate about the status and rights of Sarawak. “The negotiation is more direct because our next party president Datuk Seri Anwar Ibrahim will be the eighth Prime Minister of Malaysia. We can work together to return the rights of Sarawak to the people of Sarawak,” he said during his campaign for PKR deputy president at a hotel here today. The event was also held in conjunction with the 20th anniversary of PKR’s reformasi uprising. Rafizi said reformasi was initiated two decades ago when Anwar, deputy prime minister at the time, was sentenced to jail. He said nobody would have thought that Barisan Nasional (BN) would be defeated 20 years later. At present, PKR has six MPs from Sarawak. They are Willie Mongin (Puncak Borneo), Jugah Muyang (Lubok Antu), Ali Biju (Saratok), Larry Sng (Julau), Dr Michael Teo (Miri) and Baru Bian (Selangau). Rafizi said today marked the first time he was allowed entry to the city after seven years. He was quick to add that the only one time he was permitted to enter the state via Sibu Airport was during the 2016 state election. He recalled that he had personally written to the late Pehin Sri Adenan Satem, telling the then chief minister that he had to meet PKR supporters and members in Sarawak. “In that letter, I even told Datuk Patinggi Adenan Satem that I would not find fault with him but I would criticise (then prime minister Datuk Seri) Najib (Tun Razak). “I did not come to Kuching but Sibu instead, and from Sibu I went to Mukah. This is the first time I am in Kuching since 2011,” he said.